Early in February 1964, in the nineteenth year after the last German troops had surrendered in Prague, there arrived in London 1,564 Torah scrolls representing hundreds of Jewish communities in Bohemia and Moravia that had been wiped out in the Holocaust. For many years, the scrolls had lain unused and unattended in a Prague synagogue that had been used as a warehouse. Then they traveled across Europe and arrived at the Westminster Synagogue in London on February 7, 1964. From there, over the years that have passed since, they have been sent out to Jewish communities in Great Britain and twenty other countries of the Western world, including West Germany, to be cherished as memorials to a tragic past but at the same time to be read and studied by a new generation of Jews, the guarantors of Jewish survival and rebirth. The Torah scrolls from Czechoslovakia were part of a huge collection of Jewish ceremonial objects that were collected at the Jewish Museum at the instigation of the Jewish curators who worked there. 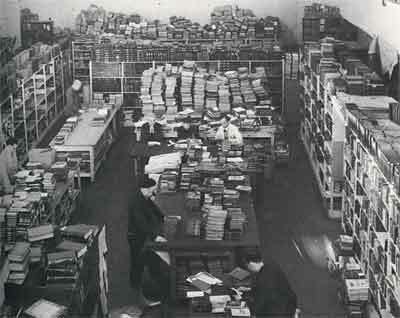 Under the watchful eye of the Nazis, Jews in Prague sorted, classified, and catalogued these treasures and arranged the scrolls in stacks reaching from the floor to the ceiling. For the Jews thus employed, it was a short reprieve; even before their task was completed, they were deported and all but two eventually perished in the death camps. However, one would like to believe that as the Torah scrolls and the other sacred objects, including some of great value and antiquity, passed through their hands, these martyrs took comfort in the hope that ultimately Hitler would fall and that the ceremonial objects, in some cases hundreds of years old, would be returned to the restored Jewish communities. this one containing Czechoslovakian books. When World War II ended, the Torah scrolls still lay in the Jewish Museum which had now become the State Jewish Museum in Prague, and thus came under the control of Artia, the official agents of the Czechoslovak government in charge of "cultural properties". Later, the Scrolls were moved to the Michle Synagogue in a suburb of Prague. But there was nothing that Artia or the staff of the museum could do to preserve the Torah scrolls. In order to keep parchment scrolls from perishing, they must be rolled from time to time. This was patently impossible to do with over 1,500 scrolls housed in desperately cramped quarters. And so the scrolls seemed condemned to slow decay. That is, until the year 1963. In 1963, Artia officials approached Eric Estorick, a well-known London art dealer, on one of his visits to Prague and asked him what might be done about the scrolls in the Michle Synagogue. Was there, in the West, any individual or organization interested in acquiring a very large number of Torah scrolls from Czech Jewish communities that had perished in the war? Estorick's response was positive and practical. To begin with, he said that an expert would have to make an on-the-spot inspection of the scrolls to determine their condition; more specifically, to see which of them were still ritually fit for use in synagogue services. He knew of such an expert in London, Chimen Abramsky, a historian and acknowledged authority on Hebraica and Judaica. Arrangements were made for Abramsky to go to Prague. His preliminary examination of about 250 scrolls found them without protective covering. Others were swathed in tattered prayer shawls. He found two scrolls wrapped in a woman's garment. Another was tied with a small belt from a child's coat. "It was quite incredible to see this," Abramsky said in London. "I burst into tears." Editor's Note: The Story Of The Jewish Torahs of Czechoslovakia appeared in Volume III of the book The Jews Of Czechoslovakia Historical Studies and Surveys which was authored by Joseph C. Pick. It can be found on pages 584-610. © 2003. The Society for the History of Czech Jews, of New Jersey. All Rights Reserved. © 1999-2006, The Czech Torah Network. All Rights Reserved. The logo design was created by Risa Mandelberg and is being used with permission. © 1997, the paperdoll company. All Rights Reserved. For questions or comments about this Web site please e-mail The Czech Torah Network at czechtorah@aol.com.